Photo by Brad Josephs - Katmai wolves were photographed near the park. Due to moose population decline on the Kenai Peninsula, a controversial aerial hunt and kill proposal will be before the November Board of Game meeting in Barrow. The first-ever proposal to hunt and kill Kenai Peninsula wolves from the air is one of the management options on the table for discussion when the Alaska Board of Game meets in November. 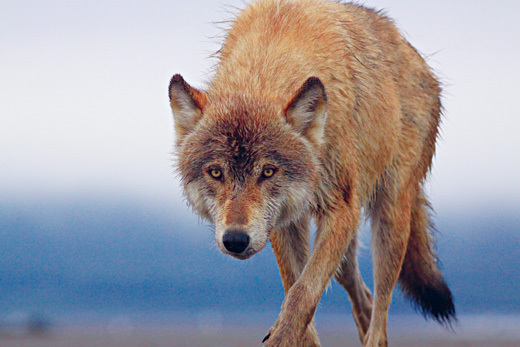 The Board of Game directed the Alaska Department of Fish and Game to devise management plans that includes aerial wolf control. Moose populations have fallen below both the state’s population size objectives and the harvest objectives for more than a decade, and this has prompted the Board of Game to call for intensive management plans, said Fish and Game Biologist Thomas McDonough of Homer. “Part of the process is for us, the department, to write intensive management plans to present to the board and to the public for comment,” McDonough said. Fish and Game will have the plan available for public review 30 days prior to the meeting, scheduled for Nov. 11-14 in Barrow. The Board of Game is scheduled to vote on what it considers the best management plan at its meeting. The department conducted aerial surveys in March 2010 on a portion of Game Management Unit 15A. Some 41-47 wolves were counted at that time, McDonough said. There have not been any other surveys on the Kenai Peninsula in recent years. “The reason we had conducted the survey was due to the chronic decline in moose numbers, which was predicted by the department based on changes in habitat. Fifteen A has a rich history in wildfires that changes the habitat. This greatly benefits moose browse and increases moose numbers,” McDonough said.